With a scandal in Northern Ireland and a damning NAO report for the rest of the UK, is the Renewable Heat Incentive reformable, or should it just be scrapped? David Blackman reports. Over the last four months, Northern Ireland has been regularly entertained by the spectacle of the public inquiry into the so called “cash for ash” scandal. Ballooning overpayments from the renewable heat incentive (RHI) scheme, which was set up to encourage uptake of low carbon heating, triggered the collapse of Northern Ireland’s devolved administration in January last year. The UK version of the RHI has not proved in the same way, but it was the subject of a withering report from the National Audit Office, which vets Whitehall spending, last month. 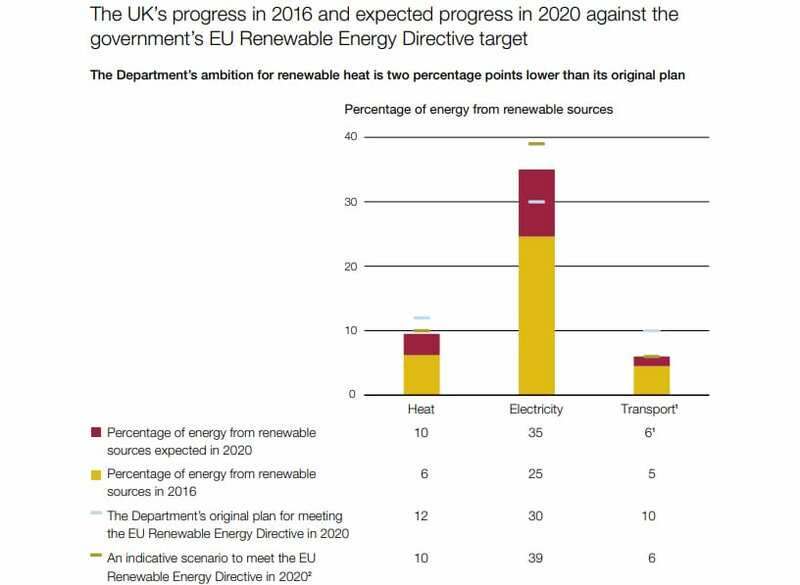 The publication of the report comes at a time when the future of the entire initiative, which has been running in the rest of the UK since November 2011, is up in the air as part of a wider review of heat decarbonisation policy that is due to kick off this year. The scheme, which was scaled back in 2015 to focus on homes and businesses not connected to the gas grid, only has a budget for new applicants until March 2021. Total payments under the RHI have amounted to £1.4 billion since 2011, the report calculates, which will rise over the lifetime of the initiative to £23 billion. However, the Department for Business, Energy and Industrial Strategy (BEIS) “cannot reliably estimate” the level of overpayments to RHI participants who have flouted the scheme’s regulations, such as by using it to heat domestic swimming pools, according to the NAO. The report also accuses the department of not knowing the impact that gaming of the RHI’s complex regulations, such as by installing multiple boilers to take advantage of the higher tariff rate for smaller units, has had. The NAO says that Ofgem, which runs the scheme, admitted last year that overpayments were worth 4.4 per cent and 2.5 per cent of non-domestic and domestic RHI expenditure respectively in 2016-17, equating to a total of £3 million. And it criticises Ofgem for focusing more on the most commonly occurring types of non-compliance rather than those with the biggest financial hit. An Ofgem spokesperson defends the regulator’s actions to tackle non-compliance. “Ofgem is committed to ensuring that public money is being spent properly and people are following the rules of the Renewable Heat Incentive scheme. 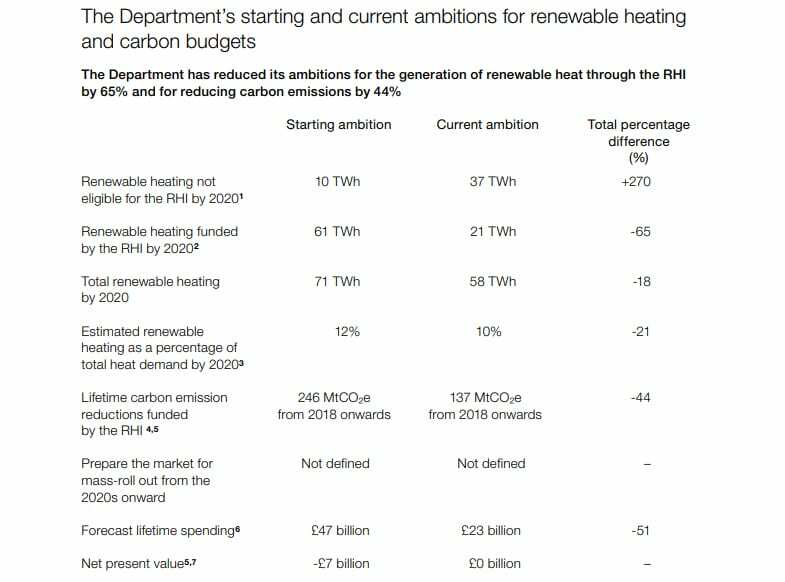 More broadly the report concludes that the RHI has not delivered value for money and the promised carbon savings. Even taking into account the increasing popularity of wood burning stoves, 10 per cent of heat is being supplied from renewable sources, 2 per cent shy of the UK’s 2020 target. Following the scaling back of the RHI in 2015, it will deliver 44 per cent of the originally anticipated carbon reductions. When considering the future of subsidy regime, particularly for non-domestic heat, the government should learn the lessons from the competitive approach used in the contract for difference and capacity market auctions.